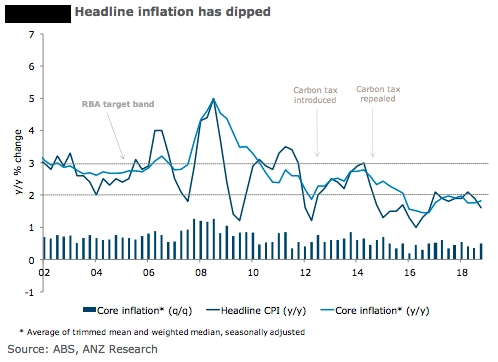 Australia’s consumer price inflation for the last quarter of 2018 is expected to see a 0.4 percent q/q rise in headline inflation in Q4, pushing the annual rate down to 1.6 percent, according to the latest report from ANZ Research. A sharp fall in petrol prices is the largest negative for the headline figure, while retail price deflation continues to be a drag. Domestic air travel and tobacco prices will make positive contributions. Core prices are expected to rise 0.5 percent q/q, which would leave the annual rate unchanged at 1.8 percent. "We see the risk to core inflation for the quarter as very much to the downside. The forecast for core inflation is consistent with what the RBA published in its November Statement on Monetary Policy," the report added. However, the evolution of headline inflation has been slower than expected, February’s SoMP can be expected to include a downward revision to the RBA’s near-term headline CPI forecast.